Our product range includes a wide range of graphtec ce6000-60 plus cutting plotter machine and vinyl cutter redsail. GRAPHTEC CE6000 Plus Series Vinyl Cutter / Cutting Plotter is amongst the easiest to use on the market whilst yielding high quality results every time. Graphtec CE6000 Plus Series - the built-in front control panel provides complete parameter control including eight preset cutting conditions, as well as advanced features like tangential control mode, down force offset, pen up speed, blade wear monitoring and more. With a 25 pin RS-232C or the High Speed USB 2.0 control interface, a newer, larger LCD screen, managing your cutting jobs is simpler than ever! 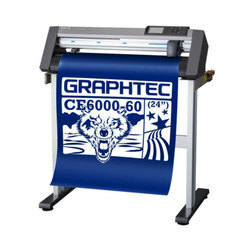 Graphtec CE6000 Plus Series comes standard with: floor stands (except for the 15" CE-6000-40 model comes with rear media roll rack), Cutting Master Plug-in, plus Graphtec's ARMS (Automatic Registration Mark Sensor) system. The latest ARMS 5.0 (Automatic Registration Mark Sensing) system standard with Graphtec CE6000 Plus Series vinyl cutter offers unparalleled media plotting and cutting accuracy via four-point rather than the traditional three point registration and an automatic panelling function for longer-length cutting and tracking requirements. It also has a choice of operating modes to complement the user's skill levels and a range of different tool condition settings. Supported software includes advanced cutting functions that improve work efficiency and productivity. We are offering our valued client’s quality approved Vinyl Cutter. This is designed in accordance with the set industry standards at our end. The offered plotter can be accessed in varied sizes and dimensions for applications in different industries. Our vendors use the latest technology and optimum quality raw materials for manufacturing this product. In order to meet the exact needs of our clients, this can be customized in various specifications. "We are interested to serve the Tamilnadu Query only". Looking for Vinyl Sticker Cutting Plotters ?